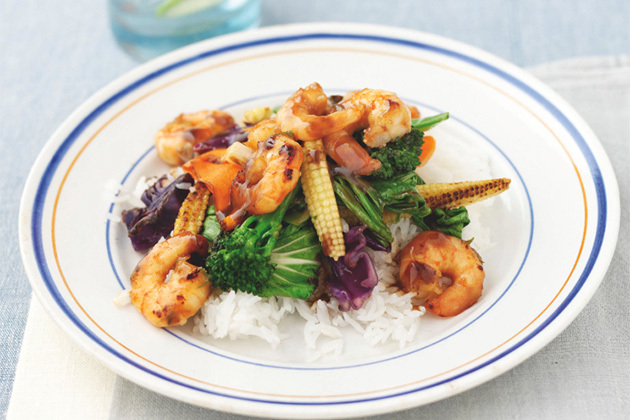 This 15-minute teriyaki prawn stir fry is a brilliant low fat protein hit. It keeps you fuller for longer and would be great for lunch the next day too! Combine the teriyaki sauce with the lime zest and juice and wasabi. Stir in the prawns and leave for 5 mins to marinate. Heat a wok with 1tbsp oil, add the stir-fry veg and cook for 3 mins. Meanwhile, microwave the jasmine rice according to instructions. Tip the vegetables into a hot bowl, add the remaining 1tbsp oil to the hot wok, add the prawns and stir fry for 3 mins until pink. Pour in the soy sauce, return the vegetables to the pan for 1 min. Serve on top of the rice.